Setting Yoga Teacher Training standards in Europe and safeguarding the standards of Yoga teaching in Europe. The EUY is the most experienced professional yoga association in Europe. We are an organisation representing Yoga Associations, Federations and Bodies across Europe. The EUY ensures high standards of Teacher Training courses amongst it’s members and collaborate in Yoga projects and providing guidelines to European governments on safe and holistic yoga practice, training and teaching. The EUY is an organisation representing Yoga Associations, Federations and Bodies across Europe. 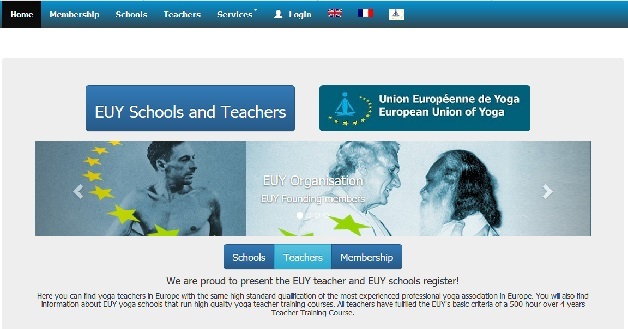 The EUY ensures high standards of Teacher Training courses amongst it’s members and collaborate in Yoga projects and providing guidelines to European governments on safe and holistic yoga practice, training and teaching. The EUY was founded in 1971 by Gerard Blitz and Andre van Lysebeth. The representatives of the National Federations met in Switzerland in 1971 to create the European Union of Yoga Federations (UEFNY) which later became the EUY. The Aim of the Initial Training Program is to enable students to develop the knowledge, skills, and attitudes necessary to become effective teachers of Yoga, and to provide a basis for the continued study of the philosophy, principles, and practice of Yoga. The European Union of Yoga (EUY) has brought National Yoga bodies together since 1971 to share common values. The EUY carries the message of Yoga that has eternal value to people in this millennium. 1. The EUY adopts the basic Yoga tenets as defined in the Yogasutras of Patanjali. 2. The EUY Yoga training follows the framework given by the classical yoga texts. Find the latest news from the European Union of Yoga on Facebook. The Aim of the Initial Training Program is to enable students to develop the knowledge, skills, and attitudes necessary to become effective teachers of Yoga, and to provide a basis for the continued study of the philosophy, principles, and practice of Yoga. An effective teacher of Yoga must have the ability to convey the methods of Yoga to students in a way, which will help them to understand the true essence of Yoga, increase their physical and mental well-being, and provide the necessary elements for spiritual growth. We are proud to announce the launch of the EUY Members Registration website. This service allows EUY Recognized Teachers and Schools to host their wep page on our website. The EUY Annual Congress is our Flagship event and has been held in Zinal for 45 years and includes Teachers, Workshops In-service Training and Social events. View all Teachers with Language and time-slots, General Information and more on the Congress website. Register and payment is available on the Congress Registration website. The EUY is hosting a Satellite Congress similar in nature to Zinal in 2019. This is the first event of its type and it is organised in order to broaden our presence and services to all our member organisations. Meaning: Yoga is to control the thoughtwaves of the mind.